Jessica Dahlgren as Catherine, Malcolm B. Rodgers as Mr. Reed and Sarah Williams as Charlotte in Melanie Marnich's These Shining Lives. These Shining Lives is a shocking story, but one that needs to be told. 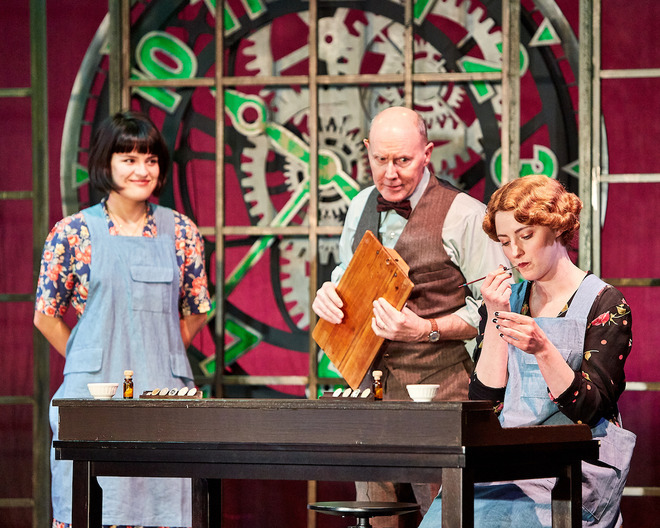 Playwright Melanie Marnich’s script is based on the true story of four women who worked for the Radium Dial Company in Ottawa, Illinois, in the 1920s and 1930s, painting faces on watches. The glow-in-the-dark radium paint along with the technique they used caused them to develop debilitating diseases, and once they began to show signs of illness, the company fired them and hired replacements, essentially treating their employees as disposable. Director Mary Ann Rodgers of Ross Valley Players’ current production of the play calls it “a delicate and lovely telling of a difficult story,” and it’s engaging, with well-defined characters who hold the audience’s attention. The outcome is known, given that it’s part of American labor history, but that does not spoil the experience. 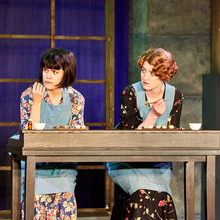 Jessica Dahlgren (left) as Charlotte and Sarah Williams as Charlotte. The acting is one of the production’s strengths. At the center of the story is Catherine Wolf-Donahue, a loving wife and mother who goes to work to help her family but is ultimately deprived of the joy of spending her life with them. Jessica Dahlgren portrays Catherine, and her performance is impressive, as she takes her character from being a vibrant young woman to one whose health gradually declines as a result of radium poisoning. Her performance is compelling, with body language, expression and decreasing energy defining Catherine’s failing body. Rodgers explains that Catherine is a composite of several characters, although the play is based on the experiences of the real-life Catherine Wolf-Donahue. “While Marnich has fictionalized the characters, possibly because there was no attempt to know them while they were living, the human experience is universal,” she says. 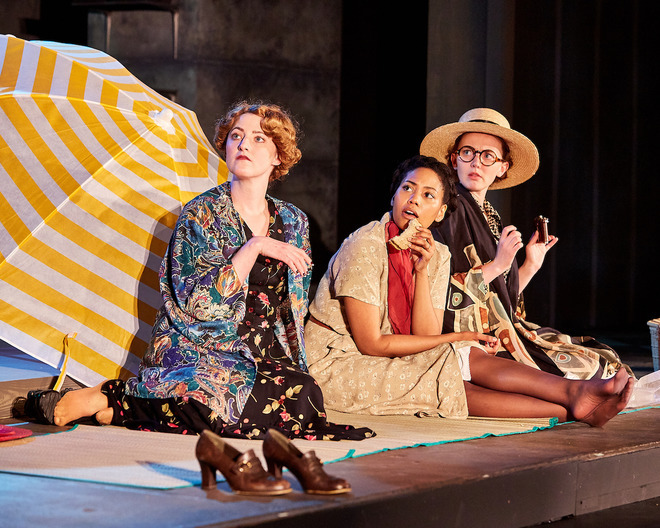 (l. to r.) Sarah Williams as Charlotte Jazmine Pierce as Frances and Carly Van Liere as Pearl. Catherine’s three friends, Frances, Pearl and Charlotte, also suffer the effects of ingesting radium, although in varying ways. 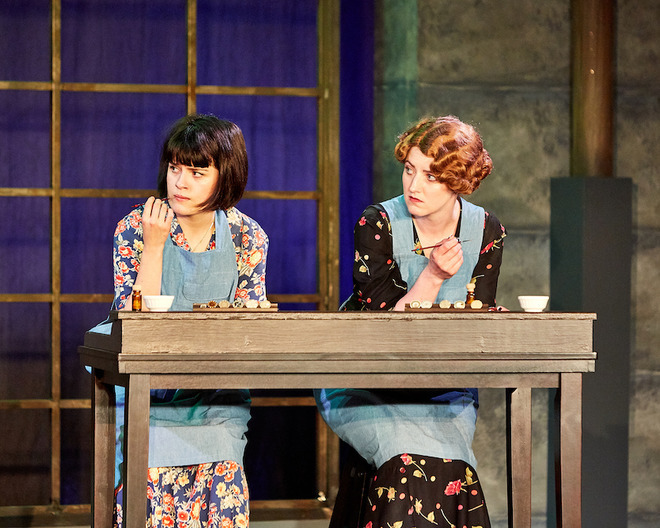 Jazmine plays Frances, Carly Van Liere is Pearl, and Sarah Williams portrays Charlotte, and each turns in a performance as a distinctive character, whose spirit slowly ebbs as the increased exposure to radium takes its toll. All three take on second roles as well, with Pierce and Williams playing reporters and Van Liere as a judge. Frankie Stornaiuolo plays three characters. He’s Catherine’s husband Tom, who has to endure the pain of seeing the love of his life slipping away, and he also plays Dr. Rowntree and Dr. Dalitsch, who make the connection between radium and illness. Rounding out the cast is Malcolm B. Rodgers, also in three roles, turning in well-defined portrayals of Mr. Reed, the company man who’s the women’s boss; the company doctor who dismisses their ailments as insignificant; and Leonard Grossman, the lawyer who successfully takes Catherine’s case to court. “The cast was all in on telling the story,” Mary Ann Rodgers reports. (l. to r.) Malcolm D. Rodgers, Carly Van Liere, Jazmine Pierce and Sarah Williams . 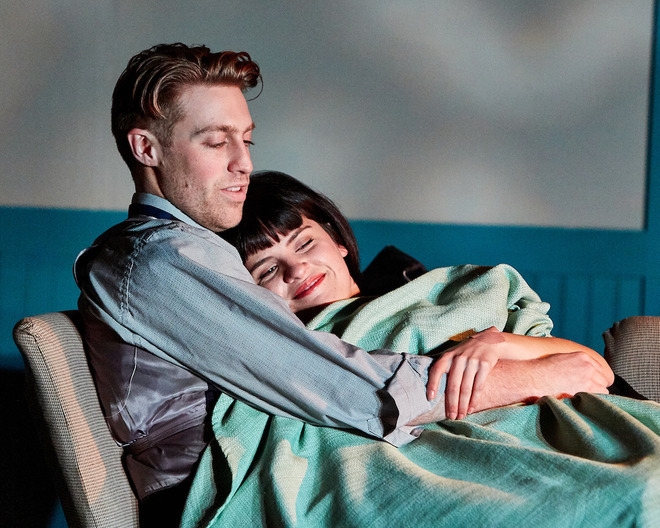 Malcolm Rodgers fills yet another role as set designer, and he makes the most of the Barn’s small stage, putting the focus on the workroom at Radium Dial, where a large glowing clock looms over the action as time runs out for the women. The set design accommodates Catherine’s home, the company offices and a court scene as well, with Tina Johnson’s lighting design helping to differentiate the locations, while Tom O’Brien’s property design is crucial in providing details, such as paint brushes, that are key to the story. Sound design by Billie Cox includes sound effects that define different scenes, such as one in town and another on Lake Michigan's shoreline. Frankie Stornaiuolo (left) as Tom and Jessica Dahlgren as Catherine. 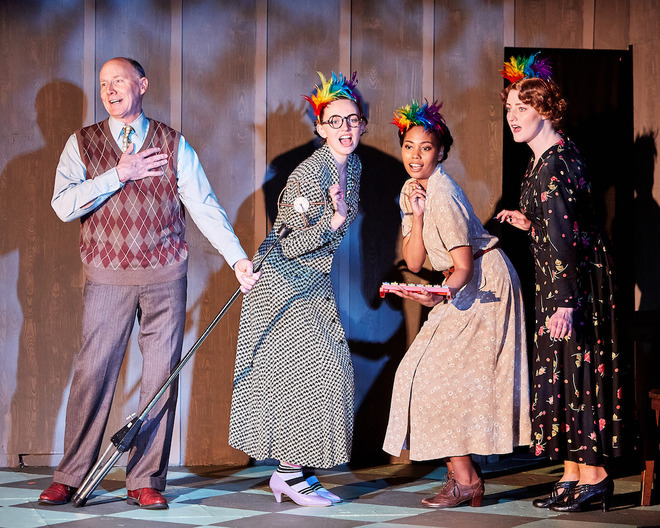 Ross Valley Players’ My Shining Lives is a well-coordinated production that does the story justice, and it also serves as a timely reminder. Corporate interests and politicians continue to put profits before people, whether it’s encouraging practices that put workers at risk or sullying the environment to better the bottom line. Denial is easy when one stands to gain, so we need to be diligent and pay attention. Thus, These Shining Lives is a wakeup call, reminding us to learn from history, not repeat it. These Shining Lives runs Thursday to Sunday through March 31. For more information and to purchase tickets, go to www.RossValleyPlayers.com or call the box office at 415-456-9555.